How Does Santa Know? A Little Bird Told Him! Well, Santa has a great many of these beautiful winged messengers to bring him tidings of good and naughty children, and whenever the flutter of their wings is heard, then the little silver bells tinkle, tinkle, tinkle, so sweetly and softly, like the song of the lily of the valley when the bright rain drops find it hid beneath the green leaves, and kiss it’s pretty modest head. 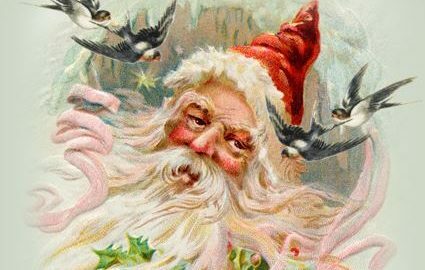 Santa always laughs outright when the little silver bells begin to tinkle softly, and the little messenger birds put their pink bills to his ear so he can hear the good news they bring. They circle swiftly around his head. Some perch upon all the odd angles of his cap, and some upon his shoulder, and some cling with their tiny talons to the shaggy borders of his fur mantle, while from their throats burst forth the most delicious music, just as in a bright May morning when beautiful rosy clouds wreathe the eastern sky and the stars are yet twinkling in the clear blue depths of the heavens. And, like birds at your window, floating softly, softly floating on the clear air, come the chime of the silver bells. 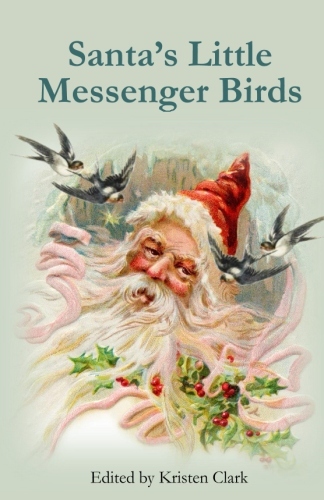 This short story is an edited excerpt from an historic children’s book called, The Little Messenger Birds, or The Chimes of the Silver Bells, written by Caroline Hyde Butler Laing and published in 1851. A delightful explanation of how Santa knows when little boys and girls have been naughty or nice, this sweet book is a tribute to a literary treasure, written for lovers of Christmas the world over. Order your copy of this short story today, and enjoy it with your family this holiday season!